Calgary Flames: Is Johnny Gaudreau Making a Case for MVP? Johnny Gaudreau is having a season for the ages. Add to the fraction that the Calgary Flames are sitting atop the Western Conference 44 games into the season — a feat the franchise hasn’t accomplished since 1993 – and the Salem, N.J. native’s campaign looks even more special. His 35 points (16 goals, 19 assists) since Dec. 1 makes him the league’s top scorer since. Similarly, in his last 25 games, he has 20 goals and 25 assists, leading Calgary to its most recent hot streak. This offensive outburst has prompted people in the hockey world to call him the MVP of the season so far. But is he really? Time will tell if he will end up with Hart Trophy honors. He’s definitely playing like a candidate now, and more importantly, he’s accumulating milestones. Following Monday’s 4-3 road win over the Chicago Blackhawks, Gaudreau became the ninth different player in franchise history to score 26 or more goals through the first 44 games in a season and the first since Jarome Iginla did it in 2007-08. A couple of weeks ago, on Dec. 27, after a 4-1 road victory over the Winnipeg Jets in which Gaudreau scored a hat trick, he became the 10th player in Flames history to reach the 50-point plateau before the team’s 40th game. He did it in 38. Iginla accounts for the last two such instances. It took 37 and 38 games to reach 50 points in the 2006-07 and 2008-09 seasons, respectively. The numbers are telling, but what they may overlook is that many of those points came in crucial moments of important games. Going back to the marquee matchup against the San Jose Sharks on New Year’s Eve, not only did the Flames beat the Sharks 8-5 and remained atop the Pacific Division, but also Gaudreau scored two goals in a span of 41 seconds in the third period to essentially put the game away. He finished with four points that evening. Two nights later, another four-point performance against the Detroit Red Wings. Observation: back-to-back four-point outings haven’t happened for the Flames franchise since Nov. 3-5, 1988, when Doug Gilmour did as such. That being said, the Red Wings got off to a strong start on home ice leading 2-0 after the opening stanza. Then in the middle period, Johnny Hockey was instrumental to the Flames comeback, assisting in all three goals scored. And, with the game tied at three in the final period, the Flames star scored the game-winning goal on the power play, and Calgary hung on to win 5-3. You might have heard this one before, but the Flames usually go as far as Johnny Hockey goes. And he has been going throughout this campaign. On Monday, prior to the Blackhawks game, Gaudreau was named the NHL’s First Star of the Week, posting 11 points and a 3-1-0 team record. A week before, he was named the NHL’s Second Star for the month of December, as well as being selected to his fifth straight All-Star Game. Since he earned the week’s first star accolades, why not make a run for a second straight? He is definitely off to a good start. Monday’s two-goal showcase against the Blackhawks was key to another triumph. Johnny Gaudreau leads the league in even-strength points (46). Tied for second is Nikita Kucherov and Connor McDavid (43). Gaudreau is tied with Alex Ovechkin and Jeff Skinner for the most even-strength goals (22). A fairly even game after two periods – tied at two –Calgary dominated in the final frame, outnumbering Chicago in high danger chances 11-1. Flames had the edge 23-11 over the course of the game. 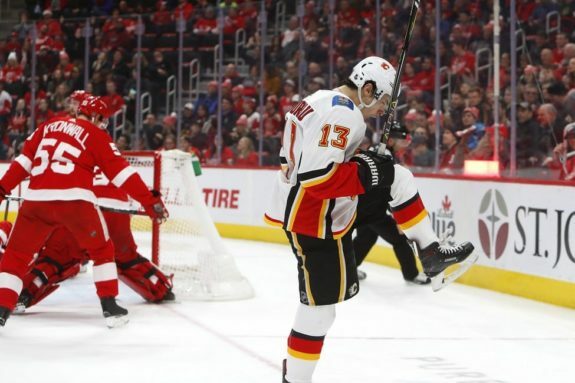 The Flames have four players with at least 50 points this season – Gaudreau (64), Sean Monahan (54), Elias Lindholm and Matthew Tkachuk (50 each). No other team has more than two such players. Much has been said about Tkachuk’s breakout season and how he is setting himself for a major contract extension this summer, but Lindholm has already surpassed his previous career high numbers in scoring (44 last season), and there are still 38 games remaining. Naturally, he has developed into a better player now. Before his arrival via trade this past summer, the Flames rotated many wingers in previous seasons with Monahan and Gaudreau in the hopes of finding a perfect fit to play on the top line. After many attempts, they have finally found a fit in the Swede. And, combining his talents along with playing the Flames dynamic duo, the numbers illustrate the gateway created for him to reveal what really he can do, taking his game to a higher level. 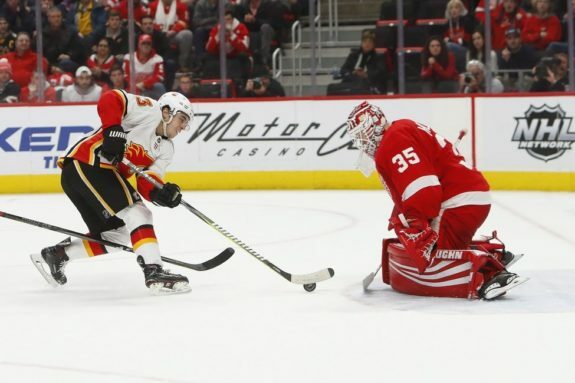 As a result of Calgary’s propensity to score — its 157 goals for account for number two in the league — the team has been winning a lot of games recently. 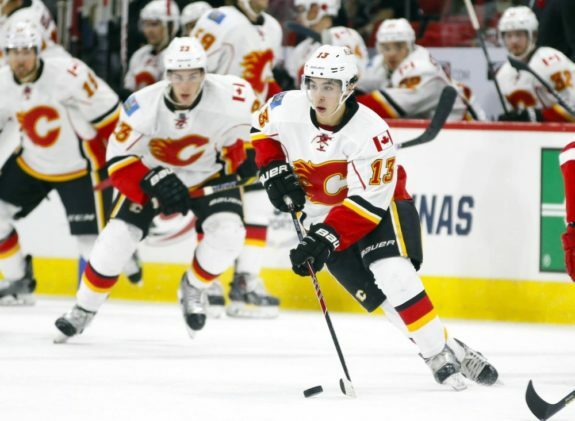 Gaudreau’s 13 points in 10 days are a big reason why the Flames were on the winning end most nights. However, Calgary went to the Christmas break on a three-game losing streak, raising questions if the slide was concerning. But since Calgary is enjoying a special season, the breaks are finally coming in their favor. Since returning from the break, the Flames have gone 5-1-1, scoring 30 goals in that span. Gaudreau has been dynamic and dangerous all season, but in this most recent stretch he has elevated his game to a different level, scoring multiple points in five of the seven games. He only went scoreless in one occasion, a 3-2 overtime loss at home to the Vancouver Canucks on Dec. 29. In 2015-16, Patrick Kane became the first American player to win the Hart Trophy after collecting 106 points. The Jersey boy is making a case to be the second. Too early to tell. But at this stage, the Flames winger is on pace for 119 points, and his team has been one of the surprising stories of the season, certainly helping his case in the conversation.